Paint your nails with your base colour. Apply topcoat and let it dry. 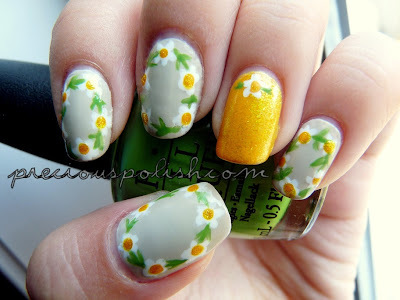 Put a few tiny drops of polish to start off some of your petals at the center of the flowers. 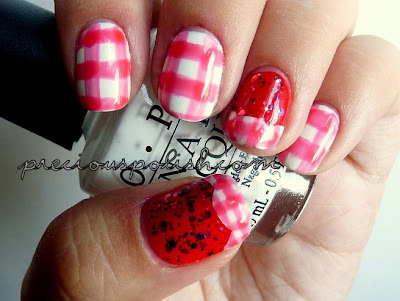 Dip a paint brush in nail polish remover and gently dab it onto the drops of polish. 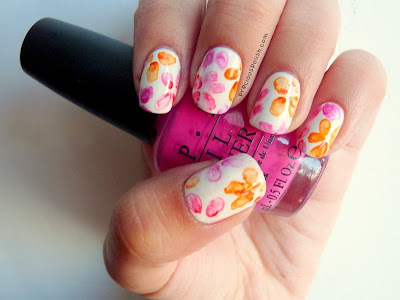 The polish should disperse and you can use the brush to drag the colour outwards to form the petals. Use the leftover polish on the paint brush to paint on the rest of the petals in your flower. If you accidentally remove the base colour or you need more vibrancy, just repeat the process until you cover things up or achieve the desired opacity! 'Less is more' is a key concept in this case- you don't want to end up with a giant blob of polish nor do you want to flood your nails with remover. Seal with topcoat and you're done! So simple! I really like the finished product- it reminds me of pressed flowers! I'm looking forward to trying out this technique some more. I think it has a lot of potential for more intricate designs. I used OPI Alpine Snow for my base. For the flowers I used OPI A Roll in the Hague, OPI Red Lights Ahead... Where? and OPI Kiss Me on My Tulips. It's almost the weekend, yay! This is both relieving and sad- next week is my last week of work. I've really come to enjoy it and I'll be sad to be leaving )': But university awaits! 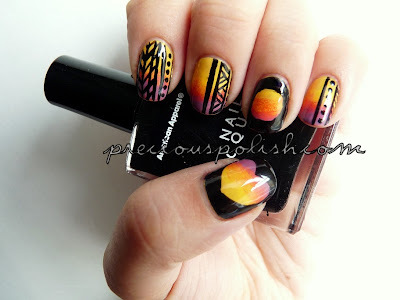 Here's an edgy manicure that incorporates a lot of different elements: gradient, tribal, and cut-out hearts and suns! All of the polishes I used are by American Apparel- my favourite brand for cremes :) I'm happy with this look- it's the perfect way to end the summer. I sponged a gradient on all of my nails with a makeup sponge and American Apparel Manila, American Apparel Neon Orange, American Apparel Sunset Blvd, American Apparel Poppy, and American Apparel Dynasty. Then I used black striping polish for the tribal print and the outlines of the shapes and American Apparel Hassid to fill.